Champion jockey Richard Hughes has been booked to ride Australian speedster Shamexpress in the Darley July Cup at Newmarket on Saturday week. Connections will be hoping Hughes will help the Danny O'Brien-trained four-year-old improve on his ninth place behind Sole Power in the King's Stand Stakes at Royal Ascot. 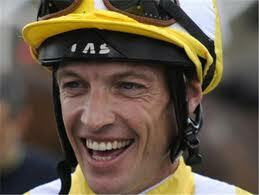 Hughes is the leading jockey in the UK at present and he rode his 100th winner for the season earlier this week. Shamexpress showed his well-being ahead of the six-furlong showpiece when going five furlongs on the July Course in the hands of work rider Paul Koumis. "He worked terrific and I'm very pleased with him. He handled the track really well and had no problem with the undulations," Koumis said. "He has come on from Royal Ascot. I think the 1000 metre (five furlongs) trip takes him out of the comfort zone and six furlongs will suit him better. "He'll work again on Tuesday and we'll see if we can get Richard Hughes to have a sit on him."